Agile experts will tell you the first rule about scaling Agile is … Don’t! The ideal Agile team model is a single co-located, cross-functional team working closely with the customer. As soon as you involve multiple teams to build the same product there will be challenges and a reduction in efficiency (the amount of value created for a given investment). However, if timelines and product scale are beyond a single team then we consider scaling to a “Team of Teams”. We attempt to structure the teams and work for maximum effectiveness by staying true to Agile principles and adopting a set of scaling patterns. There are many potential patterns, however there is usually a fundamental choice between the Component or Feature team pattern as a basis to structure the teams. This article will consider the pros and cons of these two approaches. 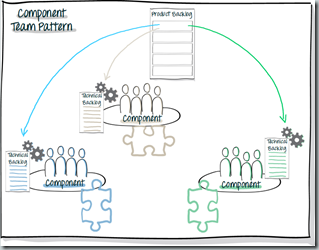 Component teams are structured to match technical layers, components or services. Examples include; iOS team, Payment API, Data Services, etc. Customer and/or Business valuable backlog items are split across the teams, each contributing functionality in the components or services for which they are responsible. 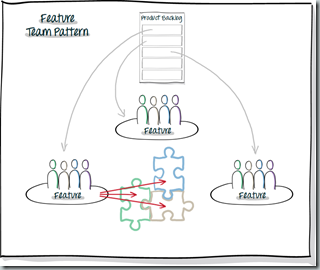 Feature teams are structured to match business value so that they take end-to-end stripes of customer valuable functionality and deliver them within the boundary of a single team. 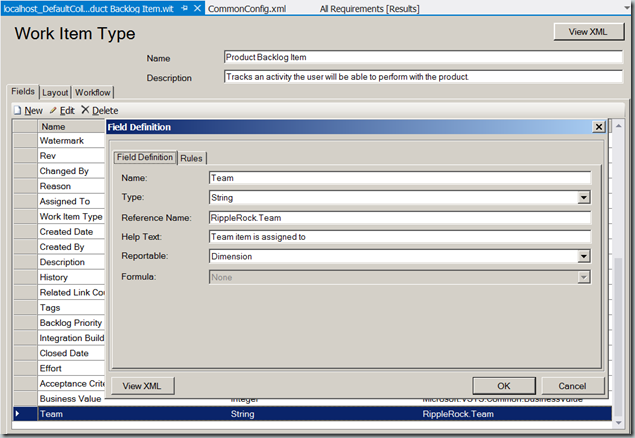 Unlike the Component teams, Feature teams work across all components related to providing the business functionality. Specialised roles and expertise are easier to fit into specialist component focused teams and it would seem logical that people with the deepest knowledge in a given component will do the best job! Related to the first point - departmental boundaries are usually easier to accommodate with component teams. Clear boundaries of responsibilities for design, build, test and bug fixing. Clear and well understood inter-team interfaces/hand-offs that match architectural platforms and layers. Teams are somewhat decoupled so that they can work independently without breaking and interfering with each other’s work. So, on face-value the Component pattern looks like a smart choice! Before rushing to a conclusion however, I’d recommend considering some of the challenges generally experienced with the Component approach. Record the time from when work on a business value feature starts through to the time it is potentially shippable. The collective delays and challenges of the points below all accumulate to produce average lead times that are often multiple Sprints long. More upfront work on architectural design so that business valuable backlog items can be chopped up into their technical components and handed out to the teams. Technical Product Owners are often added to the mix to run this process per team. 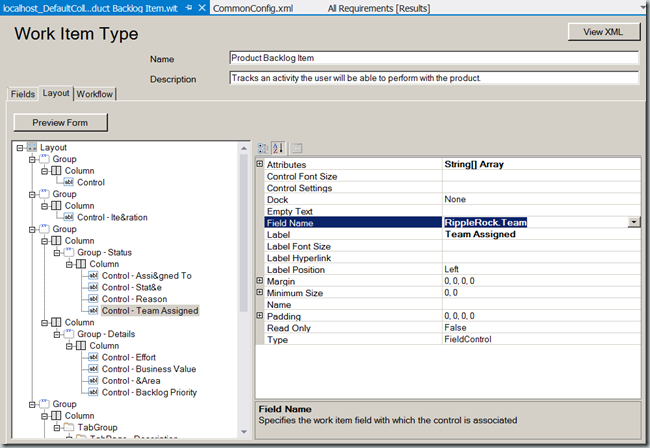 Once a team finishes a component it will need to be integrated and tested when the dependent components are complete. Integration and test teams are common additions. 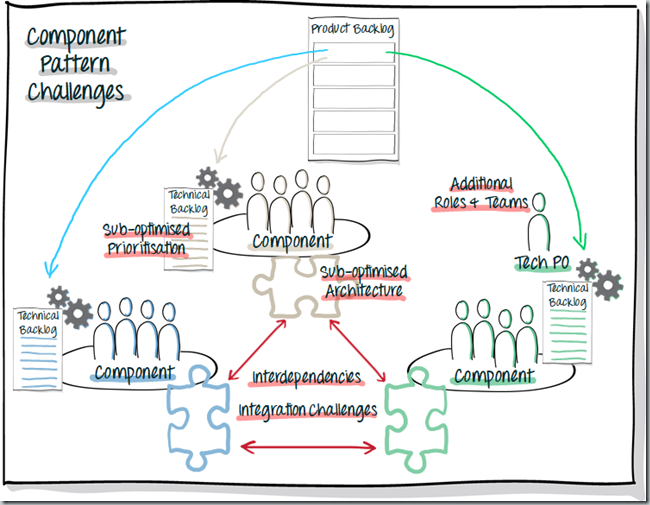 In order to design the component team structure (i.e. identify the components required) and to prepare the technical backlog items, architectural assumptions need to be committed to early. Apart from reducing the teams’ empowerment, it can also lead to later rework when assumptions turn out to be incorrect. Inter-component dependencies can block teams’ work so management and prioritisation of the technical backlogs to optimise the overall flow of high value work becomes a real challenge and overhead. Due to the focus of teams’ responsibility on their components, the Definition of Done is scoped to individual team output. In other words, we have a “Team Done” and then a “Done Done” when all components have been integrated and fully tested sometime later. The result of this hobbled DoD is that an invisible amount of debt is being carried, adding significant risk to the project and making forecasting metrics almost worthless (Burnup and Burndown charts are predicated on Done meaning potentially shippable). The decoupled “advantage” of component teams can lead to delayed integration, feedback and learning. Later discovery of issues offers the choice of often expensive rework or acceptance of lower quality. Problematic integration with extended effort and time to rectify, often with less than optimal joins between components. Late discovery of load & performance challenges leading to delayed releases and/or poor production performance. Expensive rework and potential for higher cost of ownership of final solution once in production. Loss of business context of the overall objective as teams are too removed from the business goals, working against decomposed technical backlog items. Technically sub-optimised decisions within architectural layer that seem to make sense except when viewed from the perspective of consuming functionality or the overall system. One team can become overloaded whilst another may be scratching around for work. A secondary problem of this scenario is that teams are not necessarily always working on the most valuable items, rather they work on items that aren’t blocked by a dependency and are within the scope of their service or layer. When bugs emerge, they often spread across team responsibility boundaries, leading to finger pointing as to which team is at fault and who should resolve the issue. So, does that make the pattern bad? No, not necessarily! All patterns have to be considered in a given context and then if they look promising, try them and then regularly inspect and adapt. There are also many sub-patterns that we can apply to mitigate some of the issues discussed above. Reduced lead times for producing working business aligned features, with faster feedback loops and reduction in process and role requirement. Reduced dependencies and management overhead. Increased team empowerment and architectural flexibility with later commitment. Reduced excuses for a build-up of technical debt with honest metrics showing realistic progress, or lack of. 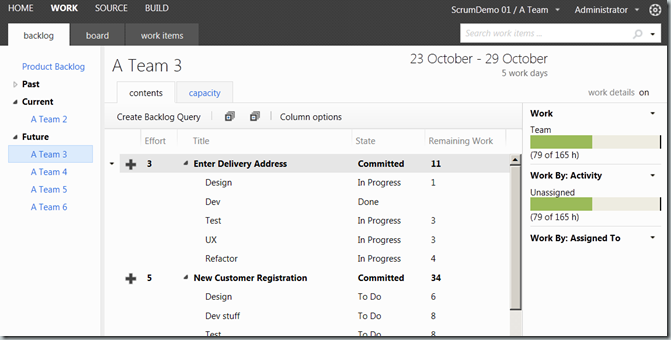 Easier to optimise teams’ workloads and focus on the highest value backlog items. Issues and bugs have clearer responsibility with the team that was responsible for implementation. However, the Feature pattern is no magic bullet and has its own set of challenges, and as for the Component approach, sub-patterns may need to be applied. When considering patterns, judge them against Agile and Lean principles and see how they stack up. After all, patterns should be helping us instantiate these principles. Deliver working software frequently – with “working” validated by a DoD that is as close to potentially shippable as practical. Working software is the primary measure of progress – track your Story Cycle-time, from the first work to potentially shippable. Maximise team autonomy and align to business value through shared purpose. Optimise feedback loops to maximise learning, validation of assumptions and reduction of risk. Not just what, but also, how long! JIT – retain plan and design flexibility as long as practical to maximise the amount of information before decision commitment. Maximise collaboration - reduce impediments to information flow. Just enough process and roles. Use process tools wisely, if they get in the way of collaboration or create too much bureaucracy then change the way they are used. The venerable Burndown chart has been a central plank in tracking progress and predicting likely release dates in Scrum since I can remember. Over the last few years, the Burnup chart has gained popularity – lets explore why. The strength of the burnup approach is in its simplicity and clarity, providing a view of net progress which helps predict when a product might be ready for release. 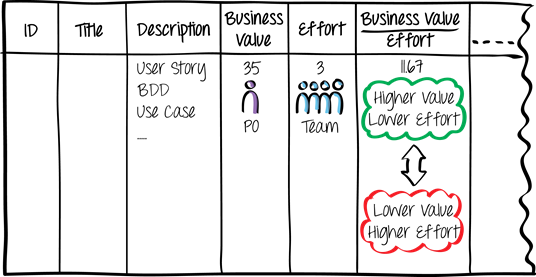 Propagating the net velocity helps to show when the product might become releasable – the dotted blue line on the diagram. The simplicity and elegance of the burndown also turn out to be its weakness. Agile approaches embrace change as a positive aspect to increase the value delivered to the customer and business. So, it’s no surprise to find that release scope often changes significantly over time (usually in an upwards direction!). In a burndown chart, it isn’t clear what contribution scope change is making to net progress, often the impression is that the team simply aren’t working hard enough. 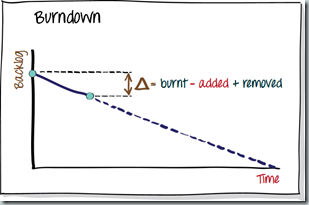 There have been a number of approaches used to enhance the burndown chart to provide deeper insight but to my mind these attempts lose the chart’s strengths - simplicity and readability (they also look ugly!). Although a team’s throughput can and does vary, working overtime, stronger coffee and more pizzas only has a marginal impact and is usually not sustainable on an ongoing basis. It turns out that the biggest lever we have to impact a release date is the scope. This is where the burnup chart comes in. 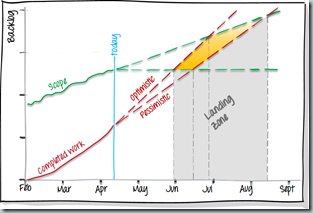 The burnup chart tracks the throughput of the team and the scope separately so that the growth in the backlog is made very visible to all stakeholders. 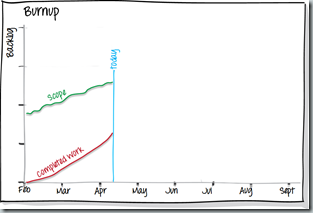 The chart illustrated to the right shows an all too common situation where the backlog grows at a similar rate to the team’s throughput. We can add a forecast for likely team throughput based on their historical performance. Forecast approaches range from simple standard deviation through to sophisticated Monte Carlo simulation, modelling the team’s throughput data (Probabilistic Forecasting). Now we add an indication of how the scope may grow over time. This chart shows a scope forecast range from zero additional scope through to an increase at the current average rate. The intersection of the forecasts ranges provides something we call the “Landing Zone”. If we drop vertical lines down to the x axis from the intersection points is shows the release date range from the earliest likely, through to the latest expected dates. Working with a delivery date range is much more healthy and realistic than forecasting to precise dates. We have found that when stakeholders see the impact of scope on delivery dates it removes some of the emotion from the debate and instead creates a healthy discussion and focus on those backlog items that are critical to release versus those that are not. While the Burndown chart is an elegant and simple view of release progress, the Burnup drives more healthy conversations that help shape the Minimum Viable Product. 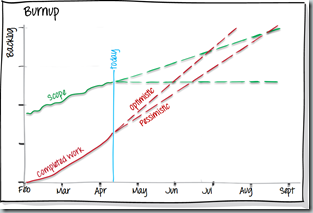 If the Burnup is used all the way through a release, it will help prevent the pressure on the team to work at an unstainable level and/or reduce quality levels to hit an unrealistic scope and deadline combination. 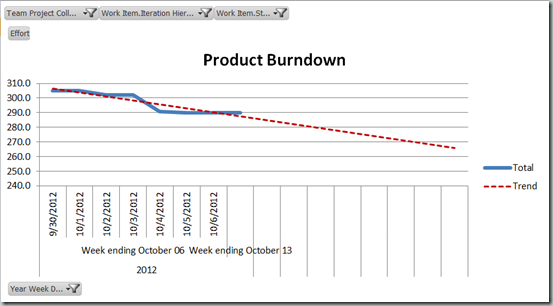 Agile process tooling is catching on with growing support for burnup chart functionality. If you use JIRA, TFS or VSTS then take a look at SenseAdapt which supports the burnup and a multitude of other handy charts. The goal of a Product Owner in a Scrum team is to derive the maximum benefit from the team’s time, in other words to maximise the Return On Investment (ROI). Where the “Investment” is the cost of running the team and the “Return” is the value of the Product Backlog Items (PBIs) that the team turn into working software. To help the Product Owner achieve this aim, they need to understand the relative business value per unit effort for each of the backlog items, so that they can guide the team to work on the items that will realise the most value for the lowest team effort. This is why it is common practice for Product Backlogs to have an ROI field which is calculated by taking the estimate of business value and dividing it by the estimate of the required team effort to implement the PBI. We then use this field as guide to order the backlog so that the higher value items, per unit effort are towards the top – allowing the team to deliver greater value in their Sprints. By default, a PBI in the standard Microsoft Scrum process template does not have an ROI field so the first thing we need to do is add the field to our Team Project. Here’s a view of a PBI in the standard Scrum process template, showing just the Effort and Business Value fields highlighted in red. The next problem to solve is how to automatically calculate the ROI value. The standard way of calculating the ROI field is by using an Excel view of the backlog via a workitem query, recalculating the ROI every time the value or effort changes and then manually publishing back to TFS. Not a great solution! Step-up TFS Rippler. This add on service for TFS has a number of useful capabilities, performing field calculations is one of them. For more information about what TFS Rippler can do and how to install it, have a look at the dedicated website or other related blogs. We can setup a couple of XML rules in TFS Rippler’s TransitionRules.xml file that will instruct it to automatically recalculate the ROI field whenever the effort or value fields change. When workitems are changed, TFS Rippler executes the instructions in rules that match the workitem change event. This example matches against changes to the Effort field in PBIs that are in the eligible states listed, and then updates the ROI field in the same PBI. We need a similar rule that triggers on changes to the Business Value field. ü We recommend testing out your changes on a test collection & project first. ü Backup your rules files before you set about modifying them. ü Remember to match the workitem and field names in the rules to the names defined in your process template! ü Also pay attention to where you place the rules within the TransitionRules.xml files to ensure that the rules are in scope for the given Team Collection and Team Project. For more information on TFS Rippler checkout the website. Populate an ROI (Return On Investment) field in your Product Backlog Item or Feature calculated by dividing the Business Value by the Effort field. Aggregate values from child workitems up to a parent, for example calculating the Total Work Remaining to complete a Product Backlog Item, calculated from the remaining work on its Tasks. 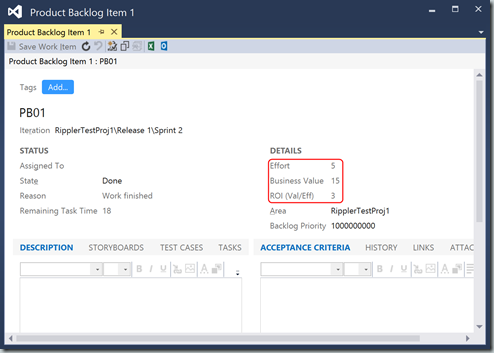 Provide a Feature’s percentage completeness, based on the Remaining Story Points effort versus the Total Story Points required to complete the feature, aggregated from its child Product Backlog Items. Outlined in Green we have the percentage complete calculated for a Feature by a calculation that compares the Remaining Story Points against the Total Story Points required to complete the feature (calculated using TFS Rippler’s aggregation facility). In Pink outline we have the Total Story Points for a feature calculated by aggregating all the Effort estimates for the related Product Backlog Items – this total figure is then in turn used to help derive the Percentage Complete and ROI for the feature. Outlined in Blue we have the ROI for the feature calculated by dividing its Business Value by the Total Story Points required to implement it. In the next few blogs I’m going to show how to make all this work and delve into a lot more detail. For more information on TFS Rippler checkout the website. 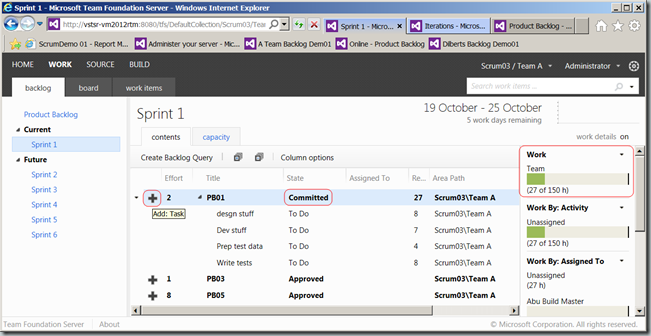 The combination of Microsoft’s latest Scrum process template and Team Foundation Server 2012 brings a host of new features and much improved user experience. Most of the interaction and administration of Team Projects moves into the web interface with only rare visits to Team Explorer required. A “Backlog” view enables the team to refine the backlog, quickly adding new User Stories and reprioritising any story by simply dragging it up or down the order. A forecast function provides the ability to visualise sprint by sprint how the team might progress through the backlog at a specified team Velocity. Sprint Planning is well supported; the team simply drag candidate stories into the new Sprint and then as they add tasks to the stories there is automatic feedback of team commitment versus their capacity. A “Board” view provides an interactive virtual team board with state swim lanes so that the teams can see exactly what each other are working on and how the sprint is progressing. 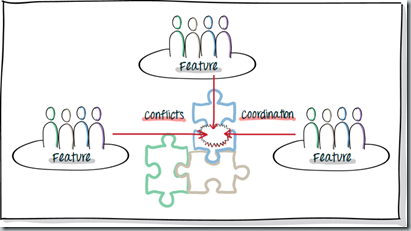 The Board view can be narrowed down by team member to aid Scrum meetings and personal work management. The user experience of the board is excellent, with low impedance changes to task states, hours and assignments with an automatic background save. All this new functionality and user experience works nicely when you have a single team working within a single Team Project. It is common though, for multiple teams to work against a common Product Backlog which requires a single Team Project. Consider for example where multiple teams are collaborating to build a product or ecommerce system. Configuring a Team Project based on Scrum V2.x template to support multiple teams is certainly possible but the behaviour of the board and backlog views makes some assumptions and requires some working around. The area path is no longer available for Product Backlog theming or categorisation which is a major setback for those of us trying to make sense of large backlogs. A team can’t see the entire Product Backlog (only those scoped to their area path) but their Sprint Backlog view makes sense. I suspect this is the intended option! Lack of complete Product Backlog visibility degrades architectural decisions and ability to work with the other teams sharing the backlog. The “Forecast” feature of the backlog view isn’t effective unless it applies to the entire backlog rather than just team subsets filtered by area path. Teams can’t pull requirements into their Sprints until backlog items have been moved to the team’s area path by someone else. The issues above drive early assignment of backlog items to teams, causing sub optimal scheduling and flow of stories. 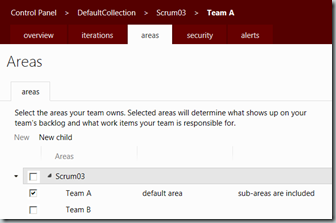 One of the teams has to be the “Default” team which inherits its area path setup from the Team Project configuration and doesn’t appear as a named team in navigation lists. All teams share Sprint start and end dates – generally good practice but teams working from different countries often have different holidays requiring adjustment of sprint dates. 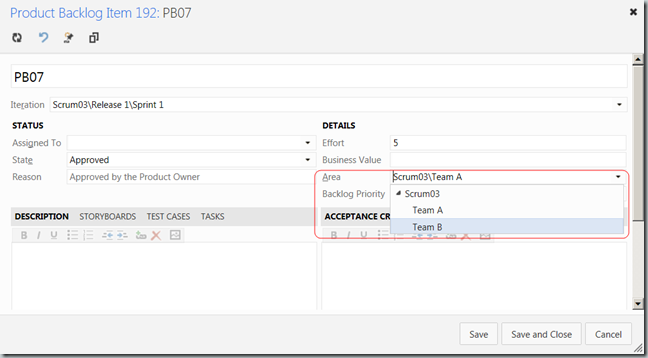 It is possible to use a custom field as a “Team” field but this approach shares similar challenges as above except that it does free up the area path for backlog categorisation. The custom field approach requires the addition of a team field in all appropriate work items (e.g. Product Backlog Item, Bug, Task & Impediment. Given the challenges outlined above I have spent some time exploring a number of alternative approaches to supporting multiple teams. Here are three different patterns that work reasonably well if you are prepared to live with a few compromises. There may well be other good patterns so please let me know if you discover them! If your teams won’t miss the area path as a means of Product Backlog theming or categorisation and all the teams use consistent dates for their sprints then try this pattern. This approach uses the area path to split the team’s views of the backlog but uses an additional “virtual team” to provide the teams a way of interacting with the whole backlog. In this example, I’m going to have two teams, Team A and Team B, working together against the same Product Backlog within a single Team Project, Scrum03. The Über Team is the key to working around many of the challenges listed earlier, providing our teams the visibility of the whole backlog for Product Backlog refinement activities and joint planning. All members of both teams are also assigned to the Über Team so that they can use the Über Team’s backlog view. I’ve used Windows groups as security containers for my 3 groups, hence why the view above only shows “1 member” for each team. The two Scrum teams provide filtered views via their area path setting so that Sprint Backlog and Board views show only those backlog items and tasks committed to by each team. The area path setting for each team should be configured to the specific team path. The iteration path configuration is consistent across all the teams as they share the same Releases and Sprint cadence. See the screenshot below that shows the backlog view from the perspective of the Über Team, with the entire Product Backlog visible. Notice that we have switched the Forecast to ‘on’ so that we see how the combined teams are likely to progress through the backlog Sprint by Sprint. The teams can jointly assess which stories should be considered for the upcoming Sprint and how they should be split between the teams and pulled (just in time) into each team’s Sprint Planning meeting. They will need to set each story they are going to consider for the next Sprint to their specific area path so that it will appear in their backlog and board views. Until they do this, they will have empty views! See PB06 above, it has been moved into both the new Sprint iteration path and the team’s area path. Having used the Über view to select backlog items for planning, teams can then switch to their own view so that they just get their own backlog items to which they can add tasks. Switching between the different team views is shown in the partial screenshot opposite. I’ve added some red marking to indicate the teams we’re currently interested in. Observe that the Über Team doesn’t actually have a name as it is the default team so it just goes by the Team Project name of Scrum03. In this example we are moving from the Über Team’s view to Team A’s view. 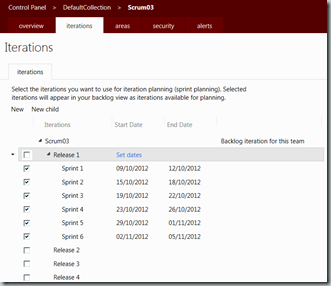 In the team backlog view, we select the new sprint and our selected backlog items should appear. If they don’t then either the area path or sprint selection may have been incorrect. 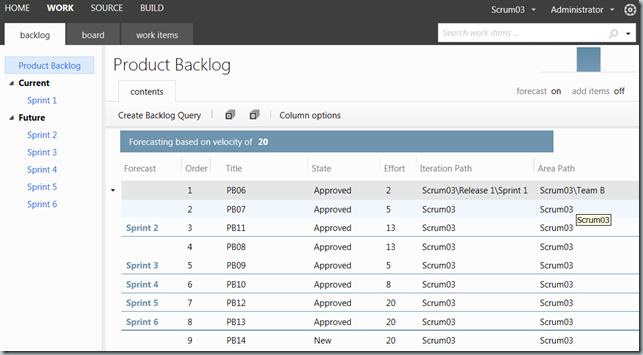 In the screenshot below, look for the ‘+’ button to the left of each of the Product backlog items that enable tasks to be added in Sprint Planning. 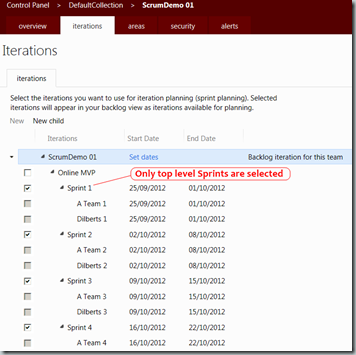 We’re looking at the “Contents” tab in this example but you’ll notice that there is also a “Capacity” tab that enables the availability of each team member to be set for the sprint. This is what drives the numbers and bar charts that appear in the “Work” section of the contents tab – see the area to the right marked in red. With this feature we can see whether our team still has capacity to pull more work into the sprint. Having planned a backlog item and confirmed that we have enough capacity to commit to the item, we move the state of the backlog item to “Committed” – see the red marker in the centre of the screenshot above. This approach is very similar to the previous pattern except that we use a custom field rather than the area path to indicate which team has ownership of a given work item. 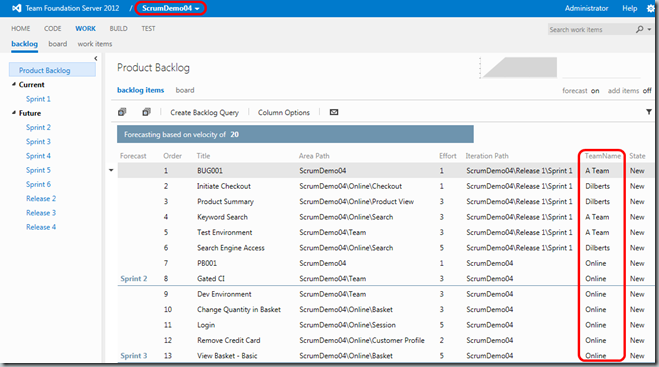 From a usability point of view it is a very similar experience but with the major advantage that we can now use the area path for backlog categorisation. The major disadvantage to the previous pattern is the amount of work you need put in to the initial setup of a Team Project to get this to work. I’m going to try and save this blog from being the longest ever by simply highlighting the differences between the Team Field and Area Path patterns – most of this being in the Setup. In this example, we have two teams, A Team and Dilberts, working together against the same Product Backlog within a single Team Project, ScrumDemo04. This approach also requires the “Team of Teams” model and here we have the “Online” team setup as default team to enable an overall view of the Product Backlog. 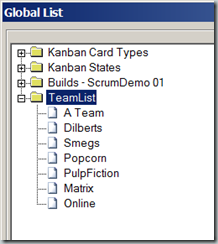 The simplest way to create the team Global List is with the Process Editor tool, part of the TFS Power Tools. 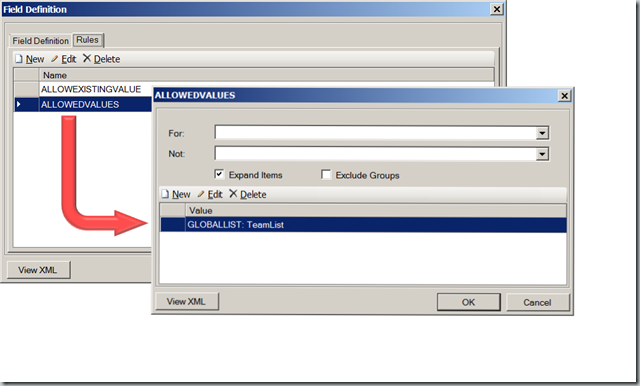 If you can’t use the Process Editor then there is always the command line and witadmin, using exportgloballist and importgloballist options along with some xml editing. "RippleRock.TeamName" is the custom field that will be added to each of the work item type descriptions to enable team selection from the teams in the Global List. After amending the team mapping and saving the file, re-import the updated CommonProcessConfig.xml using witadmin with the importcommonprocessconfig option. Use the Process Editor to add the team custom field type to each of the work item definitions that you care about and then expose the new field on the work item form so that it is visible in both Web Access and Visual Studio. Alternatively you can use witadmin from the command line and edit the xml directly if that makes you happy. 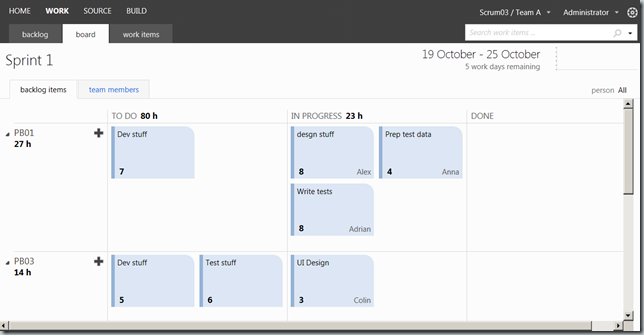 The screenshot below shows the backlog view from the perspective of the Online Team (the default team), with the entire Product Backlog visible and the Forecast option on. The only difference with the Area Path model is that we now have the team set by our custom field, while the area path is free to be used to categorise the backlog. The teams will still need to switch views between the Online team and their own as they move to Sprint Planning and update the Team field of those PBIs they pull into their Sprint. Just like the Area Path model except that we now use the Team field instead of the area path. If your teams can’t function without using the area path as a means of Product Backlog theming or categorisation or some teams need to have different dates for their sprints then try this pattern. This approach uses an extra level on the iteration path that allows both a holistic view of the product backlog but also allows the teams to view just their own items at the Sprint level. There is an Über team again but its only role is to support a combined forecast view of the overall backlog. 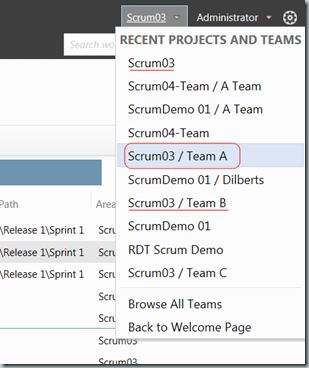 As in the previous example, we have two teams, The A Team and Dilberts, working together against the same Product Backlog within a single Team Project (ScrumDemo 01). In addition to the two Scrum teams, we also have the Online Team (like the Über team in the first example), who will be the “Team of teams”. The major differences in this approach are in the area and iteration path configurations as we will see below. 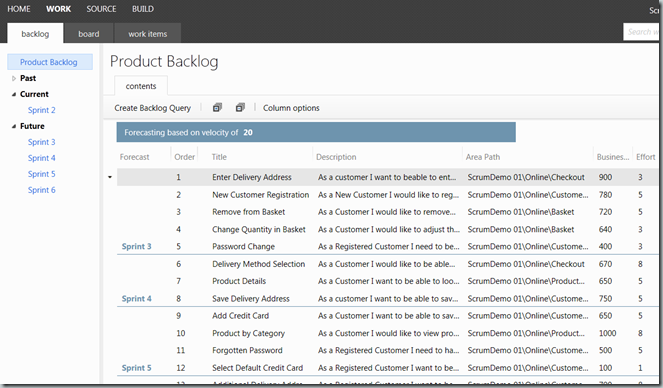 The area path can be freely used to categorise the Product Backlog as per the example shown here. This is the configuration for the whole online team. The team area path configuration can either match this or you can configure subsets for teams specialised to a part of the system. Obviously in Scrum, we encourage good cross-functional teams but in technologically diverse systems this is occasionally necessary. 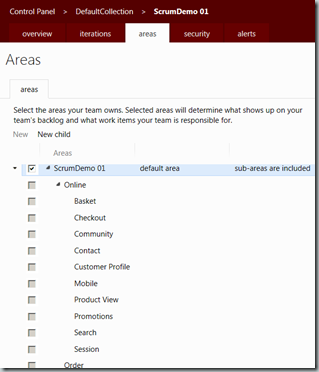 Notice that with the area path selection, it can be configured such that sub-areas are included with the parent so that all the children are also accessible to the team. This functionality is not available for the iteration path. The iteration path has additional level for “Team Sprints” under each of the standard sprint nodes. This enables individual sprint start and end dates and also provides the team filtered data we need to drive the backlog and board views. 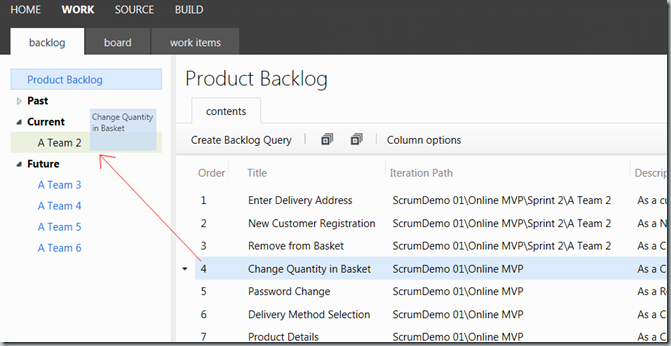 By default, new Product Backlog items are created at the node set to be the “Backlog iteration” for the default team, or Über team in our models. 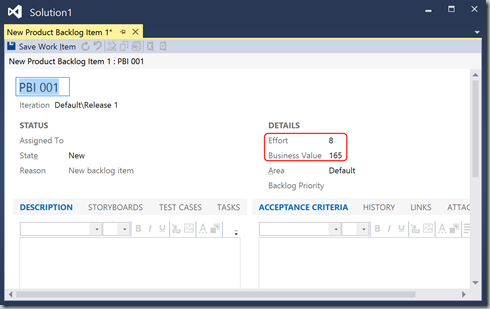 To scope backlog items for a release, simply move them to the Release iteration path node – Online MVP in this example. We are looking at the A Team’s iteration path configuration and we can see that they are set to only be able to see their “Team Sprints”. See the screenshot below that shows the backlog view from the perspective of the combined team of teams, with the entire Product Backlog visible. The Forecast feature is showing how the combined teams are likely to progress through the backlog sprint by sprint, based on the parent sprint nodes rather than the individual team sprints. 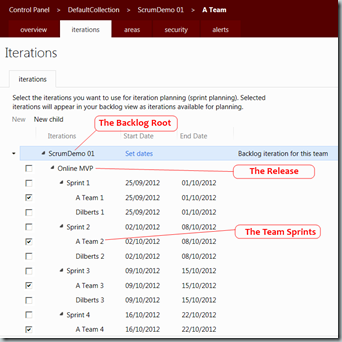 From the team specific backlog view we see only the sprints for that team but we also see the entire backlog. In the screenshot below, the team are dragging a backlog item into their sprint for planning. The other team will also see the entire backlog, including those items that the A Team are planning – as you can see from the iteration path which is indicating which team has each item. Teams can pretty much stick with their own view for planning and working through the backlog and really don’t need to keep switching to the team of teams view as we did using the area path pattern. The Area Path model is my least favourite as it sacrifices a key categorisation facility and also offers a clunky user experience. The Team Model is a better model but it requires quite a bit of setup work and shares the same issue of user experience as the Area Path model. My personal favourite is the final pattern as it frees up the area path, has great flexibility of sprint configuration and a better user experience around Sprint Planning. I’d be very interested to hear your opinions and experience too. The performance of software delivery teams is so often undermined by team members being shared with other teams or regularly borrowed for operational support and other emergencies. We know that small, collocated, cross functional teams provide optimum performance. 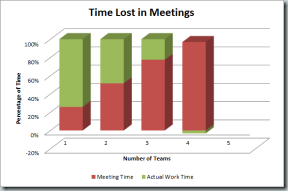 So why is it so difficult to have a small group (7 +/- 2) dedicated and focused on one project at a time? One major reason is that organisations have too much Work In Progress – WIP. Just count the number of in-flight projects and then count the number of teams available to deliver them. If there are more active projects than teams then there is too much WIP. Reducing the number of active projects results in a dramatic increase in the rate of value delivered to customers. In their excellent book, PeopleWare, Tom DeMarco and Tim Lister describe: "flow”, a state of deep concentration necessary for “high-momentum” tasks such as engineering, design, development, and other aspects of building software. It takes 15 minutes or more to achieve this state and only a moment to lose it. Every time a team member is interrupted, it costs the company fifteen minutes while they re-enter a productive flow of work. Solving complex problems requires close team work with swift collaboration. When a colleague switches to work with another team, any unfinished work they were involved with can block progress of fellow team members. In the worst case, the original team may have to wait for the team member to return before completing a highly specialist task. Over specialisation is another issue that drives organisations to share people across multiple teams but I’ll save that for a future blog. It takes a focused effort to gain and retain a sufficiently deep understanding of a complex business and technical domain. Attempting to achieve this feat across multiple simultaneous projects, leads to a shallow veneer of knowledge and a poor basis for smart decisions and design. Being shared across multiple projects erodes commitment by providing places to hide, and we hear this sort of thing: “Sorry I didn’t get my stuff done because I was working on the other project”. 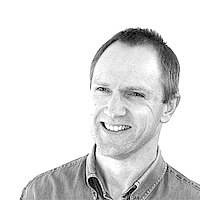 In most organisations, fully live-like testing environments are rare and expensive resources that are vital to ensure the software is of sufficient quality to release to production. Like a crowd of people trying to get through a single small door, these environments become a bottleneck on a project’s journey to live deployment. The greater number of projects in-flight exacerbates this situation, leading to a queue of projects and delaying the delivery of value to customers. Of course, all these problems tend to be cumulative. 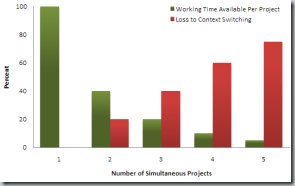 So for example, the reduced time for actual work caused by multiple projects is further compounded by the switching cost, leading to very little productive working time. Organisations that accept shared team members as an inescapable reality, must also accept the reality that their teams are never going to perform as well as they would like. So the bottom line; reduce the number of simultaneous projects and focus team members to one team and one project at a time to increase the flow of value delivered to customers.